WJI is working to improve municipal courts in Milwaukee County to prevent or minimize the incarceration of defendants who fail to pay monetary forfeitures. Unfortunately, until recently, a fair number of defendants wound up locked up essentially because they were poor. Although municipal court judges are required by law to warn defendants of the possibility of incarceration and to explain to them potential options if they cannot afford to pay their forfeitures, some judges fail to do so. WJI has made some progress on this issue. It persuaded the Milwaukee Common Council to allocate $45,000 for a part-time lawyer at Milwaukee Municipal Court to advise defendants. WJI also persuaded the Milwaukee County Board to increase the fees that municipalities must pay to the Milwaukee County House of Correction for incarcerating defendants that municipal judges send to jail. WJI proposed the increase as a way to encourage municipalities to decrease their use of incarceration as a penalty for simple ordinance violations. As a result of these efforts and others WJI and its partners have undertaken, incarceration of indigent municipal court defendants has dropped dramatically. 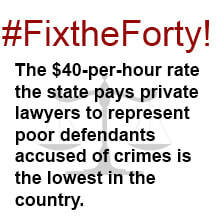 WJI is working to convince the State Legislature to increase Wisconsin’s lowest-in-the-nation $40-per-hour rate of payment to lawyers appointed by the State Public Defender's Office to represent indigent defendants. WJI persuaded the Supreme Court to extend the deadline for submitting comments on a proposal to raise the rate to $100 per hour, enabling more than 90 additional individuals and organizations to submit supportive comments. WJI’s heavy coverage of the issue in its blog and newsletter also contributed to the outpouring of support for the proposal at the Supreme Court's public hearing on the matter. WJI also submitted its own testimony. Although the Court declined to raise the hourly rate for lawyers appointed by the State Public Defender's Office, the justices readily acknowledged the pay was too low and expressed concern that the state was confronting a constitutional crisis in ensuring that indigent defendants had effective assistance of counsel. 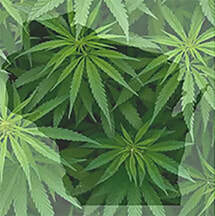 WJI is also working to repeal a state law making second offense possession of marijuana a felony. In Milwaukee County, this law is used overwhelmingly against African-American men. WJI also is involved in seeking county advisory referenda throughout the state on the issue of legalization of marijuana. Polls show a majority of Wisconsin residents favor legalization, but the Legislature has refused to even hold hearings on the issue.